Finding a job in the marijuana industry can be an intensive process. With increasing recreational legalization, business is booming and competition can be fierce. Applications for work as a budtender or receptionist flood the inbox of various dispensaries from hopeful cannabis enthusiasts looking to get in on some of the action. As the industry continues to diversify, it’s helpful to look outside of the dispensary for alternative cannabis job opportunities such as marijuana edibles jobs. One sector of the cannabis industry that is experiencing significant growth are marijuana edible jobs. Edibles are a great alternative for patients and consumers who seek high levels of THC, but prefer not to smoke. Historically, edibles contain much higher quantities of THC per serving than traditional methods of smoking marijuana flower. For medical patients, marijuana edible jobs have important implications. Edibles are often prescribed since they provide a longer, more sustained high and can be very useful for prolonged nausea, insomnia and more. There are a number of ways to create tasty, effective edibles. Depending on the protocol of a specific kitchen marijuana edibles job, products may be baked using hash oil or traditional cannabutter, which involves utilizing natural marijuana trim and cooking it in regular butter or oil. Once the dosage of cannabis is decided on, bakers infuse it into the food product and cook it just as any other chef would cook a meal or pastry. For the most simple cannabutter recipes, all you need are these three ingredients. The amount of marijuana you should use depends entirely on the quantity and potency you are trying to achieve. Finely grind your marijuana flower. This can be done simply using a small marijuana grinder if you are making a small quantity of edibles. You can also use stems, leaves and other trim to make your butter. Do not over-grind the flower as this will only contribute to its overall surface area and therefore increase the plant-like flavor of the marijuana. Check out http://www.cannabischeri.com for more useful tips on how to create the best edibles and prevent mistakes. Some marijuana edibles jobs involve taking the ground bud and baking it at a low temperature like 240-250 until the flower is very dry. This begins the process known as decarboxylation and recently has been recognized as an integral step in the creation of potent edibles. Place butter in a saucepan on low heat and wait until it melts completely. Often, chefs suggest adding some water to the mixture to avoid burner the butter or cannabis. Adding water also helps to make the taste of the butter more mild. Add the ground marijuana to the butter in increments, stirring to combine the mixture evenly. Let the mixture infuse. This is the hard part for most people. In order to make the most potent butter possible, the mixture really needs time to cook and infuse. You want to let it simmer anywhere from thirty minutes to four hours. Most experienced cannabutter cooks will tell you to leave it in longer for maximum effect. Strain the mixture. Once the butter mixture has fully infused, it’s time to strain the bud from the butter. This can be done simply using a cheesecloth or fine sieve. Essentially, you want to separate the butter from the extracted flower. After separating, it helps to give the buds a final squeeze in order to get the most butter out of it you can! Cool and cook! Allow your successful cannabutter to cool before use. Once you’re ready to cook with it, make sure you’ve figured out how much butter you’re going to use per serving! Some marijuana edibles jobs use a more complex process known as extraction to make their edibles. Extraction requires using butane or CO2 to create concentrates, which can then be added to recipes and baked similar to cannabutter. Some kitchens prefer to work this way as it allows for a more streamlined and exact process. Additionally, the “marijuana taste” of the product is often more subtle. Cannabutter on the other hand, contains a more aggressive flavor that some chefs and consumers prefer. Marijuana edible jobs are by no means entry level positions. Most individuals who work in this field have an extensive background working in kitchens, or have pursued an education previously in the culinary arts. Creating edibles is precise work. Not only must the chef be able to create a tasty end product, they must also be rigorous in their attention to detail. In order to achieve maximum potency per serving, while abiding by state and municipal law, chefs are tasked with being exact in their measurements and uniform in their products. 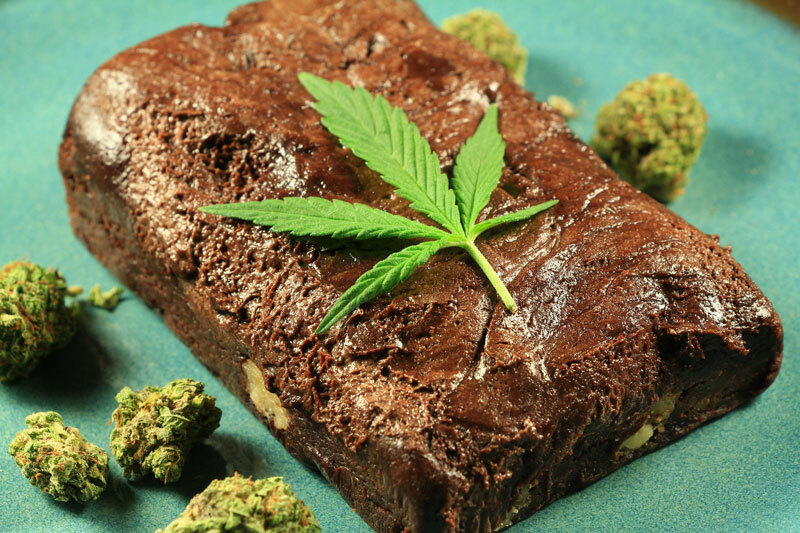 Marijuana edibles jobs are held under supervision by state health or liquor/cannabis boards who regulate the process and penalize those who do not follow it exactly. Chefs must have a unique ability to create a delicious product, while also following legislation. That said, creating edibles can be a fun and worthwhile process. Many chefs consider their edible marijuana job a dream come true as it combines their love and appreciation for both cannabis and food. This career also allows for a lot of innovation and creativity. No longer will you only see edibles in the form of just brownies and cookies. Everything from iced chai lattes to gummy worms and turkey dinner can be improved upon with cannabutter. Possibilities are endless and it takes a great chef to see their vision through from inception all the way to a finished product. Securing a marijuana edibles job is one of the more well paid positions in the marijuana industry. Though salaries will vary, some edible jobs make upward of forty to fifty thousand dollars a year and beyond for leading professional kitchens. Larger operations require not only one or two head chefs, but a variety of other prep cooks and kitchen assistants. If you feel that you do have the experience it takes to be a successful edibles creator, it’s time to start your job search. Upon visiting the websites of established kitchens, you may be able to find information detailing whether or not they are hiring. There are not many forums for finding marijuana edible jobs, but positions do exist and more are being created everyday. If you’d like to work for an existing operation, it helps to ask around and do some online research to see if anywhere is looking for help. Can I Start My Own Edibles Business? For those interested in starting their own operation, this requires a more in-depth and prolonged process due to state legislation. Creating edibles legally for sale in dispensaries or any other form require the use of a commercial kitchen. In many states where medical and/or recreational marijuana is legal, chefs are forbidden from tasting, sampling, or taking home any of their products, as this breaches government oversight and regulation. This is unfortunate, given that many of the best chefs around the world speak on the importance of testing the food you cook. It is too bad that regulating boards seem not to take marijuana edible jobs seriously enough to allow for quality control. For the most part, edible businesses make their earnings by distributing products to dispensaries in their state. Like any other sector of the cannabis industry, competition motivates chefs to create the best products possible in order to achieve success among many other competitors. Having a healthy imagination and desire for excellence will help to separate one business from the next. In addition to working a marijuana edibles job for a professional business, some individuals have achieved success as bloggers and writers who consistently post updates on new recipes and advice columns about cooking with cannabis at home. These small scale ventures don’t have the same opportunity for consistent pay, but there are people who make their living on their blogs from advertisers and page visits. This sort of resource appeals to consumers who would like to control the potency of their product, as well as the kind of edible they’d like to create. Though there are many options to purchase edibles for sale, it’s nice to be able to make your own. Proportionally, “home cooking” is a more inexpensive venture than purchasing multiple individual edibles over a period of time. When searching for marijuana edible jobs, it is very important to keep current on all regulations associated with the field. In addition to having experience as a pastry chef or cook, workers must be able to obtain a food handler’s card, and any additional documentation that allows you to work with marijuana products. Legislation varies from state to state and between individual municipalities. The best way to find out what you need to get started is to visit your state’s .gov website. The information listed there is sure to be the most current and exact. Especially with constantly changing laws, rules may differ from just one year to the next. Unfortunately, working in a cannabis related field can require an irregular amount of paperwork before you are authorized to start work, but the payoff once you do begin is greater than the irritation of application. Being an edible creator is a unique position in the marijuana field as it allows for a great amount of creative control that other jobs may not offer. If you’re experienced in the culinary arts and have an unadulterated love for marijuana, don’t wait! Now is the best time to start your journey toward creating delicious THC treats!